I started my browser and cleared out the cache. Was a verdict I knew I would love to report. I knew in a moment it must be Judge Jones. On, Robert T. Pennock! on, Forrest and Haught! Who purchased the book? No one knew, maybe elves. His lies how they winkled! His obstruction so crude! In the face of such efforts, eleven folks sued. With sciencey backing from Nicholas Matzke. I think that Jeane Dixon is owed an apology. And Lauri and Gordy and Edward wrote books. Each one of their books is a cracking good read. Though the case it moved slowly, and forty days spanned. That board members lied he considered perjurious. Still Jones fined the board around two million cash. The flaws of ID for the whole world to see! By Josh Rosenau and Glenn Branch, with apologies to Clement Clark Moore. 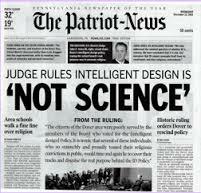 Reports of the NCSE 35:6 contains reminiscences of the Kitzmiller trial from Lauri Lebo, Jennifer Miller, Kenneth R. Miller, Eric Rothschild, and NCSE’s Eugenie C. Scott—all well worth reading!